The studio will be closed Thurs., April 18th thru Sat., April 27th for Easter/Passover break Be a part of the dance family everyone is talking about! Become A Professional Dancer, or a Professional in Life! Our Elite Students start at the very young age of 2 and continue thru to adult. Whether your child has a passion for Ballet, Tap, Jazz or Hip Hop. EDC offers the best training any school in Long Island can offer. Our pre-professional dance program is good for everyone whether they want to become a professional dancer or a professional in life. We believe the learning process should be FUN and with the right atmosphere and teachers EDC can achieve just that! Ballet, Pointe, Intro to Pointe, Tap, Jazz, Hip Hop, Kid- Hop, Contemporary Lyrical, Intro to Dance Classes for the 2 year old, Ballet/ Tap Combination Classes 3-5 years old, Tap/ Jazz Combination Classes for 5 year olds, Elite Competition Team, Company Classes, Private Lessons and much more. You are sure to find what you are looking for! At Miss Colleen's Elite Dancentre, our Faculty of distinguished professionals all carry a BFA or BA in Dance or Dance Education. Each and every one of our instructors strive to create an environment where your child can truly thrive - in all aspects of their life. Our goal is to teach our students just how great they can be. Are you ready to get started? Want to learn more about our classes or schedule? Or, are you just interested in getting a little more information? Click here to contact us and we will get back to you shortly! We can't wait for you to become a part of the dance family everyone is talking about at Miss Colleen's Elite Dancentre! Miss Colleen’s Elite Dancentre is a safe and nurturing dance academy where your children can experience dance in all it’s forms. Whether you are a serious dance student looking for a competitive level of dance or the student that wants to dance just for the FUN of it, we have it here at EDC. Under the artistic direction of Mrs. Colleen Gunn, the award-winning dance studio offers a complete well-rounded program in dance education. From Preschool to Pre Professional EDC, is sure to deliver. Whether it be Ballet, Pointe, Tap, Jazz, Hip Hop, Contemporary, or The Elite Dancentre’s award-winning preschool dance program, your child will receive TOP NOTCH training from some of the industry’s most well-known teachers and choreographers. Call us to take a tour of Elite Dancentre and experience our five spacious studios and everything we have to offer. 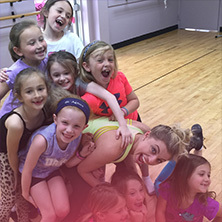 Elite Dancentre is not just a dance school, but a place all of our students can call home.